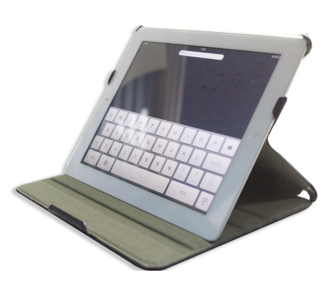 The Acase Fit Case for the iPad 2 promises to fit the needs of most users. The exterior of the case is coated in leather and the inside material is a nice swede. The swede for where the iPad 2 sits is very thin but it is anti scratch. The opposing side of the case is much thicker and well padded. The case really goes with the theme of the iPad 2's thinness. The iPad is used as a key constructional element of the case. To use the iPad in the typing position to prop up the case as seen in the images and to put the iPad into the viewing angle you unhitch half of it's body from the case and place it within one of the four notches for your perfect angle. This is very clever and is very easy to in force. To close the case the folio design latches itself onto the iPad 2 to keep the case shut, again this is very clever. One major complaint I have with this case is the fact that it has no magnets inbuilt so you can't open and close the case to put your iPad into wake and sleep mode. The functionality is all here. You have full and easy access to your volume rockers and mute switch. The sleep and wake button is nicely cut out with the same to be said for the headphone port and 30 pin dock connector. The speaker isn't quite cut out completely but that really wouldn't be possible when you see the construction of the case. The rear facing camera is also cut out inline and doesn’t block any light. The iPad is very secure within the Fit Case but the protection given isn't all that great. The screen is less padded than the back of your iPad 2. If you were to drop your iPad within this case onto a hard survive with the front facing downwards you'd be most likely skewed. Casual knocks and bumps is what this case is more suited for. The leather exterior coating is quite versatile to dust ect. 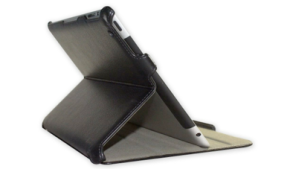 Overall the Acase Fit Case for the iPad 2 is great at keeping the thin profile of your iPad 2! The way the case functions as to it standing up in different angles ect is very clever. The protection is great for casual knocks and bumps. But the design is a tad dull and boring.